The Footligts and Life”, #49, 1910. The Yurlov Russian State Academic Choir is one of the oldest Russian choral groups. Its history goes back to the turn of the 19th and 20th century. A family ensemble was founded in Shchelkovo, Moscow area in 1900 by Ivan Yukhov (1870\71 – 1943), peasant’s son, educated to be a precentor at Christian Music School. Soon Yukhov and his friends joined with Mytishchi Carriage Works Choir and Rabinek Factory Choir. First Christian music prevails in their repertoire and the choir sings in Moscow churches. As the repertoire increases, they get more and more admirers, make their first gramophone records, the choir is invited to participate in professional theatre performances. Before long the Yukhov’s choir becomes one of the most popular in Moscow and sigs together with famous Moscow deacons, such as K.V. Rozov, A.P. Zdikhovsky, M.K. Kholmogorov, V.P. Rizpolozhensky and Imperial Theatre soloists A.V. Nezhdanova and V.R. Petrov. The choir celebrated its 10th anniversary in the Great Hall of the Moscow Conservatory. An important stage of the choir’s development was collaboration with S.A. Kusevitsky, an outstanding contrabassist and a talented conductor, together they executed Beethoven’s Symphomy No.9 and many other compositions. In 1918, a year after the October Revolution, the choir attracted attention of Soviet authorities and was nationalized. In 1919 it was reorganized into The First State Choir. January,1 is considered to be the official beginning of the choir’s history. In 1925 the group was renamed into the M.I.Glinka State Choir. Under this name the choir acquired recognition, participating in symphonic concerts and broadcasting over the radio. The choir was entrusted with voicing first Soviet movies such as “Jovial Guys”, “Circus”, “We are from Kronshtadt”, “Volga-Volga” – total of over 70 motion pictures. 1942 became a tuning point for the choir. Republican Russian Choir was established on the basis of M.I.Glinka State Choir. The new name is associated with a significant stage of the choir’s history. During the World War the Republican Russian Choir wasn’t evacuated from Moscow, and repeatedly performed in hospitals and military units. The war years as well as the first decade after the war appeared to be very difficult for the choir. After Yukhov’s death the choir wouldn’t find a permanent conductor. In the period from 1043 to 1958 it was leaded by Alexandr Stepanov (1899 – 1963), Konstantin Lebedev (1909 – 1985) and Alexandr Preobrazhensky (1890 – 1963). The choir still had no rehearsal room, which significantly complicated its work. However even under such difficult conditions of work the choir proceeded with creative development and giving concerts. Under the management of K.M. Lebedev the choir first time sang the four of five choruses by V. Shebalin (poetry A. Pushkin): “A Message to Decembrists”, “A Winter Road”, “Strekotunya Beloboka”, “An Echo”; participated in premiere of K. Molchanov’s opera “Stone Flower”, E.Svetlanov’s cantata “Native fields”. 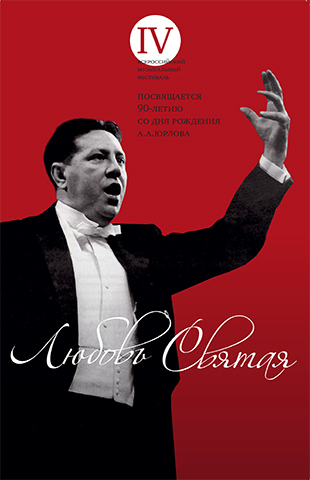 The 1958 appointment of Yurlov as Conductor and Director was the making of the choir. This immensely energetic and extremely talented young man changed the image of the choir through sheer patience and devotion, aspiring to perfection through the joy of creation, reaching the point of excellence. It was a triumph achieved by strong will, mighty energy and unsurpassed skill. Along with his work in the choir A. Yurlov headed the department of choral conducting at the Gnessin Institute, taught and worked at the Soviet Choral Society. Yurlov participated with the choir in various concerts and festivals, some of them he organized himself. Quite often there were amateur groups on the same stage with the choir; professional choral performance joined with talent activities was his bold innovation. Other choirs had never experienced it before Yurlov. The Yurlov Choir was an active initiator and organizer of so-called “chief” concerts, which became a special chapter in the Choir’s history. Yurlov gave a lot of concerts in his lifetime… They were meetings with factory and mill works, at constructions with temporary structures as an improvised stage. Thanks to Yurlov the Choir after many years finally acquired a permanent rehearsal room. It was a Church of the Protecting Veil of the Mother of God in Rubtsov, erected in 1627. The ancient deserted temple was restored especially for the Choir. Like no other during 15 years of his management Yurlov broadened creative range and the repertoire of the Choir. Traditional Russian music was gradually replaced with monumental cantata and oratorio compositions. The Choir performed “German Requiem” by I.Brams, “War Requiem” by B.Britten and other compositions. In the same years the Choir switched over to modern compositions and became a leader among other choirs who executed music of the 20th century. Alexander Yurlov believed that a modern Russian choir had to embrace a vast modern repertoire. In the period from 1958 to 1972 the Choir executed over 60 compositions of vocal and symphonic genre. They were most complicated compositions of I. Stravinskiy, A. Shnitke, V. Rubin, R. Shchedrin and other composers. Many compositions of Russian composers were first heard in the execution of the Choir, and these were truly triumphal premiers. Collaboration with Dmitry Shostakovich was a bright chapter in history of the Choir. The Choir made grandiose first performances of two significant compositions of the famous composer: Symphony No.13 and “The Execution of Stepan Razin”. Dmitry Shostakovich highly appreciated the great skill of the Choir. No important event spared the Choir’s participation. Owing to the Choir distinguished works of Soviet composers a “new musical continent discovery” for foreign audience. Russian choral music was made world cultural heritage. Triumphal concerts of the Choir in Paris, London, Rome and other European cities raised authority of Russian musical art over the world. Another special page in the Choir’s history is associated with Georgy Sviridov. He chose the Choir to execute premieres of many compositions, such as “Oratorio Pathetique”, “Poem to the Memory of Sergei Yesenin”, “Songs of Kursk”… All choral compositions created in Yurlov’s lifetime starting 1960 were first executed by the Choir. Georgy Sviridov devoted a choral concert “In Memory of Yurlov” to his friend. He was convicted that it was “Yurlov, who took Russian choral music to the international scene, gave it a really world sounding, advanced all our choral art to a new stage. Now it is not possible to sing as they did before Yurlov”. Yurlov was responsible for the reintroduction of many priceless musical masterpieces and previously forgotten 16th -18thcentury traditional Russian Christian music. In 1967 the Choir performed during International Festival in Bydgoshche, Poland with a unique Russian Christian music program. During the years of Khrushchev’s church persecution and later Brezhnev’s stagnation the act of reintroduction of Russian choral culture monuments of 16th -18th century, including the Petr’s epoch monuments, compositions of N. Diletsky, V. Titov, N. Kalashnikov, A. Vedel, M. Berezovsky and D. Bortnyansky can be estimated as a feat. Previously forgotten priceless Russian musical masterpieces sounded from the stage again. This event draw a wide response. And not just because there was a spirit of freedom – in this regenerating tradition Russians felt deep roots of the native culture. In 1966 the Choir was given an academic title for outstanding service in music, and in 1969 it was decorated with an order of the Labor Red Banner. During international choral festival in Italy the Choir was awarded with Rome Prize (1969). It was only after his death in 1973 that the decision to include his name in the choirs’ title was made. In 1997-1998 alarge-scale all-Russian festival “Holy Love” in the memory of Yurlov took place, it joined music campaigns in over Russian cities, competitions, theoretical and practical conferences and “Yurlov Readings”. Give credit for Yurlov’s worthy successors – Yury Vladimirovich Ukhov and Stanislav Dmitrievich Gusev who maintained traditions set by Yurlov and preserved the status of one of the most authoritative choirs in Russia. The Choir participated in premieres of Russian music masterpieces of the 20th century as before. Many records of choral, cantata and oratorio music of Russian and West European composers are acknowledged as choral execution standard. Honoured Art Worker Yuriy Vladimirovich Ukhov (1937-2007), the pupil of Yurlov had been working in the Choir since 1964 as a choirmaster. After his teacher’s death Ukhov was heading the Choir eight years till 1981. He managed to preserve creative potential of the Choir, carried on the progressing and solved difficult creative problems. Under his management the Choir first executed a cantata “At the Reading of a Psalm” by S.I. Taneyev. Over 23 years since 1981 to 2004 the Choir was headed by Moscow State Conservatory graduate, People’s Artist of Russia, Professor Stanislav Dmitriyevich Gusev (born 1937). This experienced talented conductor came from the Bolshoi Theatre where he had been a choirmaster for 10 years. S.D. Gusev deeply apprehended unique identity and creative traditions of the crew, he preserved and extended cultural trends of the Choir. With Stanislav Gusev the Choir often executed with leading Russian symphony conductors such as E. Svetlanov, G. Rozhdestvensky, Yu. Temirkanov, V. Fedoseev, V. Georgiyev, Yu. Simonov, P. Kogan, V. Ashkenazi and other brilliant musicians. Interesting from the scientific point of view was Gusev’s work to decipher Russian music monument of the 18th century – cantata in honor of laying of the foundation stone of The Grand Kremlin Palace, masterly executed by the Choir. In eighties and nineties the Choir participates in music festivals: “Russian Winter”, “Moscow Stars”, “Moscow Autumn”. The Choir traditionally takes part in concerts at the birthplace of M.I. Glinka, P.I. Tchaikovsky, S.V. Rakhmaninov. Gusev and the Choir toured extensively throughout Russia and Europe. During this period they recorded over 20 discs, 6 of them received international awards. A valuable contribution to professional and creative development of the Choir was made by its choirmaster. V. Gerasimova, G. Saveliev, V. Sorokin, V. Kapitonov, D. Semenovsky, A. Butusov represent of a brilliant galaxy of conductors and choirmasters, notable for outstanding gifts, unique qualities of nature and deep devotion to their work. Rozaliya Konstantinovna Peregudova, a Honoured Artist of the Russia, was the choirmaster of the Choir over 40 years. She joined the Choir in 1965, during the famous ages of Yurlov, and she linked her own life with the Choir. She was a witness and a member of triumphal concerts in sixties and seventies, educated several generations of artists in famous Yurlov’s traditions. Her 80th anniversary was celebrated on the stage of the Great Hall of the Moscow Conservatory.